Saturday night, after some very restful rest of burrowing my nose in a book all day, I ventured out into the neighborhood foraging for food. Living in Tokyo is bringing back the exhausting daily work of “I don’t know what that says,” a challenging aspect of living in a country where the alphabet is very pretty but looks like scribbles. It’s fun when you are on vacation, but it’s another story when a new resident working, say, 1,876 hours in one week. A story that leaves you, at times, hungry. Like an orphan standing outside the windows of restaurants bursting with wealthy patrons, I watched as they sat at their tables, tossing their heads back in laughter, busily wielding chopsticks and spoons. I wasn’t in the mood for the three restaurants I know well, leaving my options to plastic food models and menus with pictures. And I wanted to stay close to home. But what appealed to me most also daunted me most. I wandered down tiny side streets in hopes of the perfect soba shop, a quiet hideaway with a magical snippet of English on the menu. All the while, the rumble and boom of what I presumed to be thunder was carrying on in the distance. I soon found myself at the Imperial Palace moat, stumbling on a small and silent crowd of on-lookers. 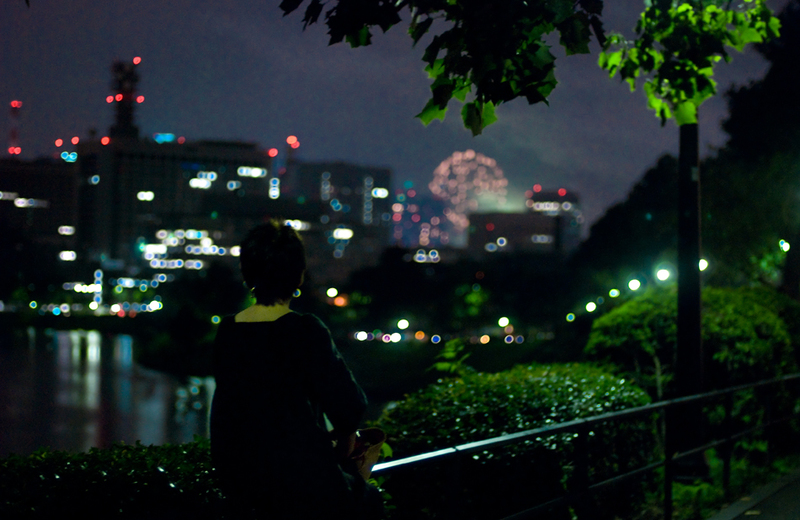 People were lining the perimeter of the palace grounds, in quiet contemplation of the spectacular, endless show far off over Tokyo Bay. The further I walked, the more people I found: sitting in trees, perched high on walls, crowding street corners. When it ended, I walked to the market and bought some fruit, gouda and crackers and returned home full and satisfied. 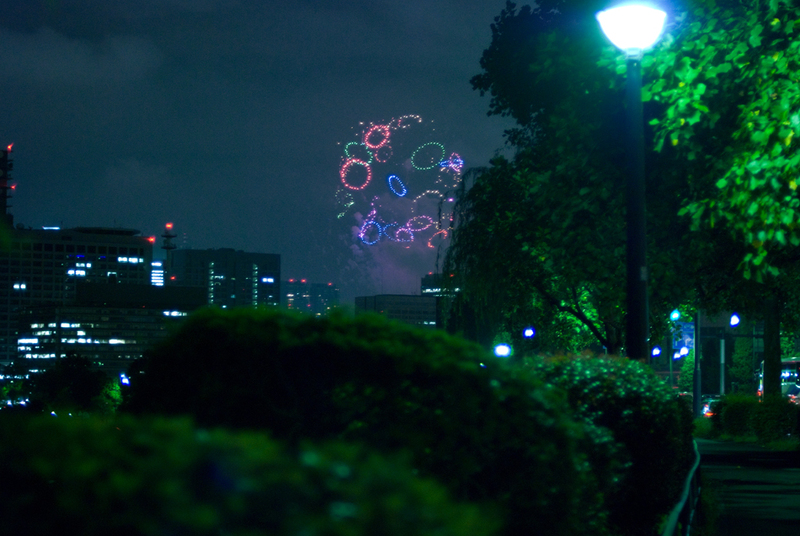 This entry was posted on Tuesday, August 11th, 2009 at 11:39 pm	and is filed under Japan, Tokyo and tagged with fireworks, Tokyo. You can follow any responses to this entry through the RSS 2.0 feed. i’d very much like to come and help figure out those menus on your behalf (although quite how i’d do that is, at present, a mystery). Charlotte, you are more than welcome to. well, that would be wonderful then. i’ll get to work on a clever translation device. Wow, these pictures are just amazing. Your post really took me back to my study abroad days in college. I’d just arrived in Prague, a few days before my program was to start. Didn’t know a soul there, couldn’t speak a word of Czech, was living in a very Czech neighborhood where few people appeared to speak a word of English, and really no one was around to help since the program staff weren’t around yet. Even though the alphabet was familiar, I felt so lost. And hungry. I think I ate my first two meals out of a vending machine in my building until my body adjusted to the time change and I felt more oriented. Hope you get more comfortable in Tokyo. I’m really loving all your posts about the city.